Although not as high in healthy omega-3 fatty acids as some saltwater fish, freshwater fish are a nutritious choice for lunch or dinner. Most freshwater fish are low in fat and high in protein. One serving of most freshwater fish provides more than 30 percent of the dietary reference intake of protein for adults. A 3-oz. 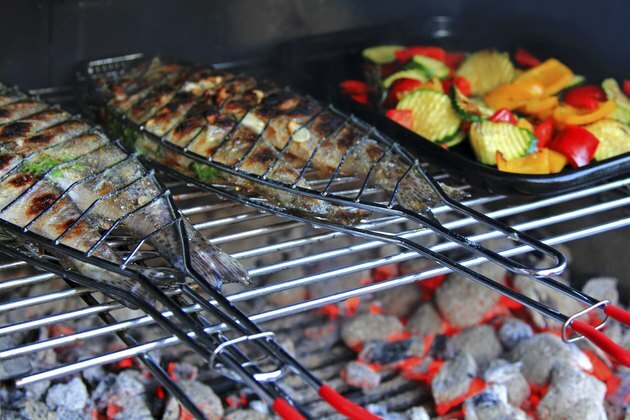 serving of freshwater bass, cooked with dry heat, contains 124 calories, which come from 20.6 g of protein and 4 g of fat. One serving of bass contains 74 mg of cholesterol, which provides 25 percent of the maximum recommended amount of 300 mg per day. One serving of bass provides 20 percent of the dietary reference intake of iron for men and 9 percent for women. Bass also contains a significant amount of three other essential minerals, with one serving supplying 11 percent of the DRI of copper, 42 percent of manganese and 25 percent of selenium. Additionally, one serving provides 15 percent of the DRI of pantothenic acid and 82 percent of B-12. Three oz. of perch, cooked with dry heat, contains 99 calories. Perch is very low in fat, with each serving containing 21.1 g of protein and only 1 g of fat. However, perch is higher in cholesterol than bass, with 98 mg per serving. Like bass, one serving of perch provides 25 percent of the DRI of selenium. One serving also supplies 18 percent of the DRI of copper and 33 percent of manganese, as well as 12 percent of the DRI of iron for men and 6 percent for women. In addition, one serving of perch provides 10 percent of the DRI of niacin, 15 percent of pantothenic acid and 78 percent of B-12, all of which are water-soluble B vitamins. Like perch, walleye is low in fat, with one 3-oz. serving containing only 1.3 g. Three oz. of walleye, cooked with dry heat, also contains 20.9 g of protein and 101 calories. Walleye is similar to perch in cholesterol content, with 94 mg per serving. Walleye is slightly higher in minerals than perch, with one serving providing 22 percent of the DRI of copper and 38 percent of manganese, as well as 18 percent of iron for men and 8 percent for women. One serving of walleye also supplies 22 percent of the DRI of thiamin, 13 percent of riboflavin, 15 percent of niacin, 15 percent of pantothenic acid and 82 percent of B-12. Trout is higher in calories and fat than other freshwater fish, with one serving containing 162 calories, 7.2 g of fat and 22.6 g of protein. However, most of the fat in trout is heart-healthy unsaturated fat. Only 1.3 of the 7.2 g of fat is saturated fat. Trout is also lower in cholesterol than other freshwater fish, with 63 mg per serving. One serving of trout provides 23 percent of the DRI of copper, 40 percent of manganese and 25 percent of selenium. One serving also supplies 21 percent of the DRI of iron for men and 9 percent for women. Trout is higher in many B vitamins than other freshwater fish, with one serving supplying 30 percent of the DRI of niacin, 38 percent of pantothenic acid, 30 percent of thiamin, 28 percent of riboflavin, 15 percent of B-6 and more than 100 percent of B-12.